Even if you aren't prone to overeating, the holidays and stress they unwrap can mean some weight gain for even the most dedicated weight watcher. Luckily, the folks at New York-Presbyterian Hospital/Weill Cornell Medical Center have some tips to help keep you from tipping the scale. You can avoid this psychological turmoil by adopting a more sensible approach to holiday eating and exercise, says Megan Fendt, a registered dietitian at New York-Presbyterian Hospital/Columbia University Medical Center. "You will not gain weight from one meal by itself," said Fendt. "Consistency is the key; if you eat healthful meals during the months before the holidays, a splurge or two can be fit in." Meanwhile, the hospital's registered dietitian Michele Murphy says, "Don't deny yourself the occasional treat. What people need to realize is that everybody can eat something of everything -- it's just a question of how much." The following is the holiday feast survival guide -- a road map of sorts to keep you and your diet from straying too far this year. * Plan ahead. Remember the "calorie bank" concept. Save calories the week before to give yourself more calories to eat during the holidays. * Never go to a party hungry. Snack on fruit, non-fat yogurt or vegetables before you leave for the party. You will be less tempted to overindulge while you're there. * Take control of your environment whenever possible. Never engage in conversation while sitting next to a platter of your favorite cookies. Grab a bottle or glass of water as soon as you arrive at a holiday gathering and take a few minutes to survey your food choices. * Bring a low-fat dish to the party. Share with other guests. * Fill your plate with vegetables and lean protein foods -- then add small "tastes" of high-fat dishes. * Eat slowly and savor every bite. It takes 20 minutes for the stomach to signal to your brain that you are full. * Decide in advance how you will handle gifts of cookies and candy. Don't leave them out in the open so that you will be tempted to binge. Keep one or two and give the rest away. * Limit alcohol consumption. Not only does alcohol contain many calories, but it can also stimulate your appetite and reduce your willpower. Try a wine spritzer, or, better yet, avoid alcohol completely and drink seltzer or mineral water with a twist of lime, or a non-alcoholic tomato juice cocktail. * Don't allow holiday activity to slow down your exercise program. Exercise can help burn off extra calories and make you feel good about yourself. * Moderation is the key to weight maintenance. A forkful of cheesecake will do less damage than a whole piece. Remember, an occasional indulgence will not destroy your weight-loss attempts, and if you don't love something don't eat it. 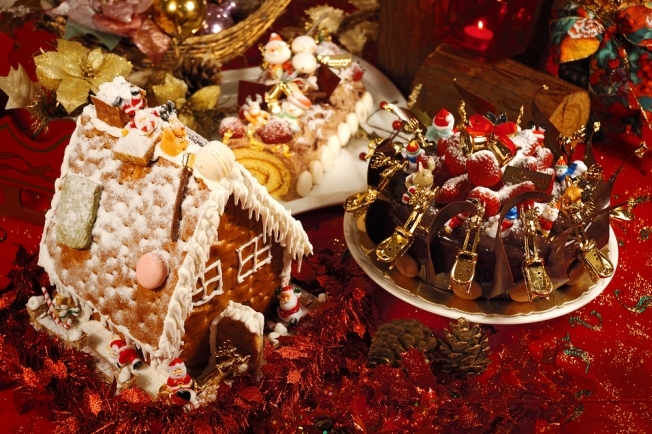 Skip the everyday foods and only indulge in your holiday favorites as a way of lowering your intake.